Okay, wow, this is vibrant! So far all the Scarabii have been fairly muted - even the big guy himself, with his red, gold and blue - but this one is just wild. 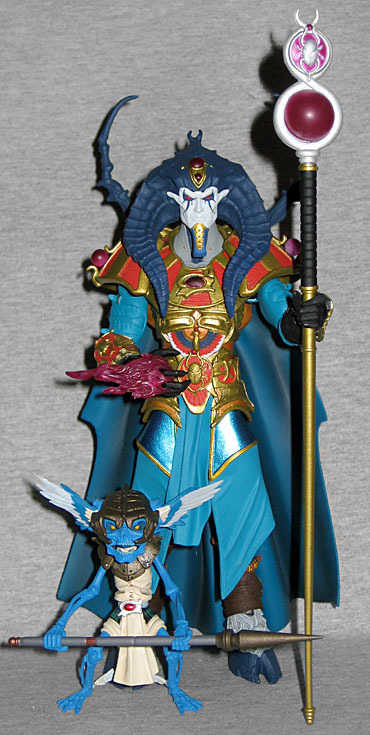 He seems to have swapped the red and blue sections from Scarabus, while retaining the golden armor, but the red is closer to orange and the blue is kind of a bright teal. His gloves are black and his leg-wraps are brown, adding just a few of non-shocking hues to the overall colorscheme. His accents, on the other hand, are vivid magenta. His hooves, horns and pincers are a dark blue, and his face is white. Taken all together, this variant looks like a clown. All he's missing is a harlequin pattern. His Timekeeper accessories are a dirty gold. When we get to the alternate face, some of the color choices become clearer. 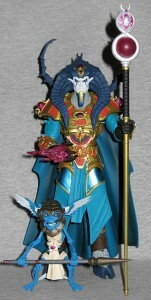 The second face turns him into Horos, a clear stand-in for the Egyptian god Horus, lord of light. Horus had the head of a falcon, and so this face turns the figure into a bird. 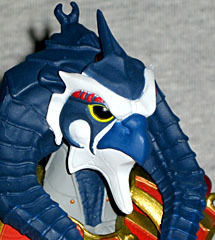 More than that, though, Horus's face was depicted a certain way: mostly white, with a blue upper beak, red stripes over the eyes and a dark blue pattern on the cheeks; in fact, the specific dark blue pattern seen on this sculpt! So that explains the white face, but not the clown-clothes. The Horos face is significantly larger than the Scarabus face, so it looks oversized when you first put it on, but it grows more natural over time. I'm not feeling the super bright costume colors on this variant, but I really like the Horos face. And hey, the heads all come off at the neck, so if you feel the same way I do, you can swap this head onto a different body and create whatever look you want.